J.M. Field Marketing is proud to announce their Fulfillment Team Lead, Ben Albert, won the “Best Intermediate Craftsmanship” award at the 2013 Anime Expo (AX) in Los Angeles for his robot-themed “GaoGaiGar” costume. The Anime Expo, founded in 1992 and held every year at the Los Angeles Convention Center during the July 4th weekend, is known as the largest and second longest running anime and manga convention held in North America. The action-packed 4 day event has become so renowned, it attracts well-known guests as well premiers of movies, shows, bands and more. One of the most popular traditions during the weekend is the event Albert competed in, known as Masquerade. Masquerade is a Cosplay competition that brings in talented costumers from around the world, all hoping to bring home one of the awards that include Best of Show, Best Craftsmanship, Best Presentation, and more. Many of the attendees dress in Cosplay costumes the entire weekend and there is always much excitement and anticipation that surrounds the Masquerade. Other popular events during the weekend included a fashion show, concerts, a Battle of the Bands, anime music video contest, as well as a multitude of vendors with anime goods. The Anime Expo is a 24-hour convention that has late night tabletop and video gaming, karaoke and more. Albert’s elaborate costume was a 9 month project carefully hand constructed from materials including EVA foam, Foamcore board, Sintra and even features a dual speaker system in the chest that allowed for sound clips to be played during his presentation, fully completing the Cosplay effect. 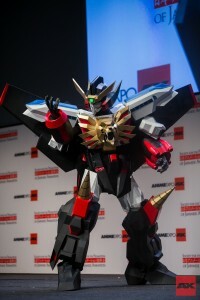 The robotic costume, inspired by GaoGaiGar, a character in the 1997 show The King of Braves GaoGaiGar, also features other special effects such as the ability to light up the lion’s eyes on the chest piece, the crest in the head and the stone on the forehead. Everyone at J.M. Field Marketing would like to congratulate Ben Albert on his 2013 Anime Expo win!